You're home after spending the day at work, and you open your Facebook homepage. A job ad catches your eye and it sounds enticing. Decent money, work from home, not an MLM scheme - keywords that call out to you. The downside? It sounds a little too good to be true and you're not sure if it's a scam job ad. Let's be clear. If the job advertisement sounds too good to be true, there is a very high chance that it probably is! Look out for keywords that sounds a little suspicious. Often times, scammy keywords will make the job ad sound like a "get rich quick" scheme. Some keywords to look out for include, "work from home", "flexible hours", "very high pay", "no need for previous experience", and "must be ok with travelling overseas". Keep in mind that context is also important. Jobs that require years of specialization and experience with the words "no previous experience required" should be a red flag. In a world where insurance agents and MLM schemes are rampant, jobs advertised as "work from home" positions are often fraudulent positions. A standard "work from home" scheme will offer people large sums of money in exchange for minimal effort. These scams aim to get two things out of you: your personal information and money from your wallet. Victims have reached out to Scam Alert Singapore with stories of agents asking for some money to purchase "starter packs", insurance, and membership fees before disappearing with the cash. In other cases, victims have been asked to reveal personal information such as their full names, IC numbers, phone numbers, security codes, and one time passwords (OTP's). You can stay safe from such schemes by looking out for positions that require you to pay a sum of cash before you start your job, and jobs that offer high pay for little to no effort. Remember when the Nigerian scam emails was a big issue? Aside from promising a faux life, the emails often featured terrible English. But don't be confused! 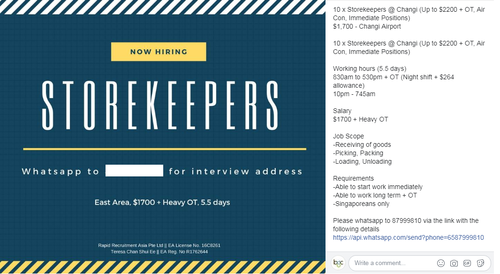 Some recruiters choose to write in a common language in hopes of enticing local, Singaporean job seekers. What we mean by bad English are ads written with multiple grammatical mistakes, lack of capital letters where it SHOULD be, and wrong words used at the wrong points of the ad. Does the ad sound like it was written by a scammer? Chances are it is. If your brain doesn't scream "SCAM" the moment you see this ad then you need to rethink what professional ads mean to you. Instead, look out for ads that exude an air of professionalism, like the one below. Trained consultants and recruiters will know to include memorable information like working hours and whether or not overtime (OT) is required. Try to look out for job ads with more in-depth information. Promising ads will feature memorable information such as working hours, salary, the job scope, the requirements needed, and ways to contact them. Vague job descriptions, no job responsibilities, lack of contact information are some information reputable job ads will have. Recruiters from large employment agencies may not divulge information such as the company they're hiring for, but candidates will always be provided with supplementary information. These include the agency name, recruiter's name and contact number, and at times a special serial number at the end of the job ad. Ok, so what's a safe job ad? Where can I find a BGC approved job ads? Lastly, it's important to remember that despite wanting a job real fast, you should take precaution to make sure you're not falling for a scam. Ask yourself, does a hiring manager really need your bank details before allowing you to sign a contract? Follow your gut or if unsure, do your own research. Call the company and ask to speak to a hiring manager or check them out online. Think you've fallen for a job scam? Alert your friendly neighbourhood police force as soon as you can! Let's be smart and stay safe! *All images are for illustration purposes only. Want To Know If A Job Posting is Fake? Look Out For This 1 Thing.